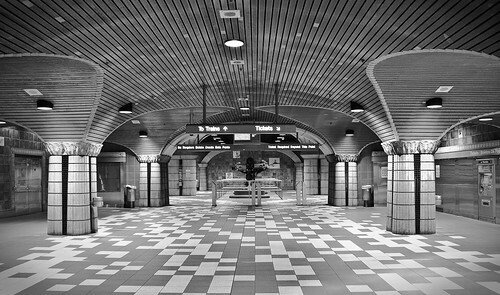 The Metro Red Line station at Hollywood and Vine. Photo by flickr user Jack Wei. Here is a look at some of the transportation headlines gathered by us and the Metro Library. The full list of headlines is posted on the Library’s Headlines blog, which you can also access via email subscription or RSS feed. Here’s the first of two excellent Metro-related interviews. The Planning Report sat down with Martha Welborne, Metro’s Executive Director of Countywide Planning, to discuss her work as Metro’s chief planner. The whole interview is worth a read for the insights it gives into Metro’s Union Station master planning process (Metro bought Union Station last year), planning for various rail lines and a number of other topics. Next up: Los Angeles Mayor and Metro Board Chair Antonio Villaraigosa discussed with Grist the initiatives his administration is undertaking to make L.A. a greener place. As a regular Source reader can imagine, transportation has featured prominently in that agenda. Give it a read for the discussion of CicLAvia, L.A.’s bike plan, Measure R and America Fast Forward. The Westside Subway station renderings have given a glimpse of what Wilshire will look like once the subway is up and running. But for those who can’t picture what’s there now — and I couldn’t off the top of my head — L.A. Magazine has some handy “before and after photos” at the link above. Enjoy!